Toy Story - one of the most loved movie by Pixar. Adults or Kids everyone in someway or the other is connected to the characters of Toy Story. Toy Story potrayed relationship of toys with their owner Andy. This 3 part movie series is one of the most loved Animated Movie. And this also makes it one of the most popular Halloween Theme Costume Ideas for 2012. If you are searching for Officail Liscened Disney Toy Story Products - PartyBell.com is the right place for you. From kids to adults, from small party accessories to one of a kind, you will get all kind of stuff here. Toy Story costumes are different in its own way. The story is too like a same replica of its costumes - innovative and pleasant. 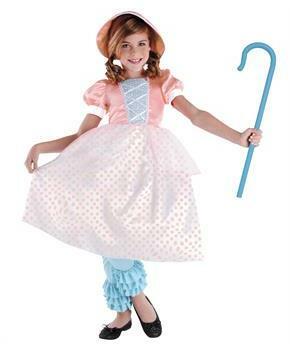 Mary had a little lamp – little girls look cute in this Bo Peep Costume. This costume will extra charm to little girls this Halloween. This Child costume includes dress, bloomers, hat, and staff. This is an officially licensed Disney costume. It’s quite comfortable in nature and made for best fitting. Buzz Light year’s name was inspired by Apollo 11 astronaut Buzz Aldine. Aldine acknowledged the tribute when he pulled a Buzz Light-year doll out during a speech at NASA. Buzz Light-year always been a source of adventurous inspiration for many Kids. This Classic Toddler Buzz Light - Year costume includes Jumpsuit. Socks not included. Buzz light-year Deluxe Child Costume includes bodysuit, hood, boot spats. Does not include socks. This is an officially licensed DISNEY costume. Jessie is a cowgirl, and part of the Woody's Round – up gang. Jessie Deluxe Toddler costume includes jumpsuit, hat, hair bows. This is an officially licensed Disney Toy Story costume. Cowgirls always look different from the crowd. Their costumes always make the person look impressive and cool. Costumes Includes Jumpsuit and cowboy hat. Does not include boots. 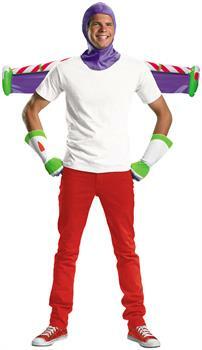 This is an officially licensed Disney's/Pixar Toy Story and Beyond costume. Buzz Lightyear wears a space suit with various features such as retractable wings and transparent helmet, a laser weapon. This Disney Toy Story costume includes jumpsuit, hood, jet pack, glowsticks and boot covers. Surprise your kid by being his very own Buzz Lightyear this Halloween. Sheriff Woody Pride is a cowboy pull-string doll, and Andy's favorite toy. Appearing in all three Toy Story films, he usually acts as the leader of the gang of Andy's toys. 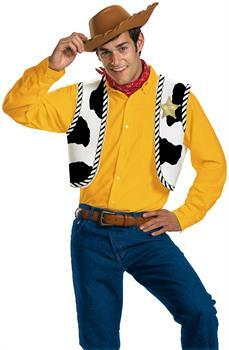 Let your child be the fun-loving loveable Sheriff Woody in this Toy Story Woody Classic Adult Costume this Halloween. Costume includes Jumpsuit and hat. Does not include boots. This is an officially licensed Disney/Pixar's Toy Story and Beyond product. Buzz is all known for his accessories specially his jet pack. Making him fly all over the space.Jet pack Includes wings. This is an officially licensed c Disney product. Woody all known for his cowboy skills. But also his accessories adds to his profile Kit includes wings. This is an officially licensed c Disney product. Woody with his cowboys attributes pulls everyone towards himself. Hat is an officially licensed Toy Story product. Buzz Lightyear Accessory includes: Hood, gloves and inflatable jet pack. Does not include T-shirt or pants. This is an officially licensed Disney product. 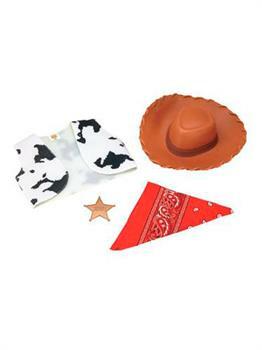 Costume includes Hat, vest, star and bandana. Does not include shirt, belt or pants. This is an officially licensed Disney product. Hence the wide best variety of costumes and accessories will just add like an icing on the cake. They will make you look different.And will never allow your Euphoria to end. These products not only provides you with a different class but also with an edge over other toy story products.Costumes based on toy story theme will allow you to have a full remembrance and feeling of a real toy story character .And will not allow you to get over the experience that you would have during this costume wear.